Do you feel like you are drowning in your own home? Does it feel like clutter has taken over your life? I’ve been there and it’s not fun. I have been standing in my freshly cleaned living room still feeling like it’s a complete mess. There was even a time when I basically lived out of one room because I couldn’t stand the clutter because we had too small a place to properly store anything away. Something had to change in my life and it had to change quickly. I couldn’t live with the clutter anymore. If you are at this point and looking to start getting rid of clutter but have no idea where to start – you are in the right place. Don’t let clutter drive you mad. I’m going to show you how to get rid of your clutter quickly so you can start enjoying your home again. First, clutter is not filth, but oftentimes clutter can make a home look messy. Clutter is that paperwork sitting in that hot spot on the kitchen counter. It’s the random papers and books on a shelf in the living room. Clutter is your kids toys pushed up against every wall in your family room because there isn’t anywhere else for them to go. If you’re like me, you deal with it for a week, month, or maybe a couple of months putting things away every so often. It’s inevitable that those things will make their way back into these spots. You’ll be sitting on your sofa one day staring at your kids red mega blocks wagon sitting off to the side yet completely out of place. It’s in that moment that you get up and start cleaning and putting the paperwork and toys back in their place. Knowing in a week you’ll be organizing it all again. That is unless, you start decluttering your home now. It’s always easier to keep your house clean when you have less stuff inside of it. Take it from someone who got rid of 80% of her belongings. Cleaning takes far less time now. I’m giving you my top tips for decluttering, the same ones I used to declutter my own home several times. One thing to remember during your decluttering session is to make quick decisions. The longer you stop to think about something the longer it will take you to complete the session. If you feel like you need more time on a specific item either keep it where it is or store it away and check again in 3-6 months. Check out my post 5 Linen Closet Organization Ideas. Before we get started you will need to label some items. 1 or more garbage boxes, 1 important paperwork box, 1 bills box, 1-7 donate boxes and 1 shred box. These boxes can be as big or as small as you need them. Go through your kids toys and decide what toys they actually play with, which ones are broken, and which ones can be donated. Toss the broken toys and donate the ones you can. That’s the easy part. Either you pick or have your child pick 3 toys they can play with all year long. These are usually reserved for the most important toys like favorite stuffed animals or technology they use often. Split the rest of the toys into 4 piles, one for spring, one for summer, fall, and winter. Put three of the four piles into boxes or totes and leave the rest in your kids room. Every season change out their toys. Less available toys, means less clutter everywhere else in the house. These shelves make for a great way to organize toys in your kids room. Additionally, my son loves this little bookshelf to put all his books in. Gather all the paperwork throughout your home, junk mail, letters, birthday cards, bills, ect. And place it into one pile. Turn on Netflix and start going through all the paperwork dropping them in their designated boxes, garbage, important, bills, and shred. Once you are through all the paperwork, file away the important papers and the bills. Place the shred box near your shredder. If you don’t have a shredder or want to buy one google a shredding company in your area. Protip: Have a kid help by telling them the papers need to be ripped into tiny pieces. Keeps them busy and they get to help. I talk about getting kids to clean in How to get your Kid to Clean and Actually Enjoy it. As for the important paperwork and the bills box you will then take some time to file that paperwork away. Go ahead and order a mail organizer like this and install it near your front door. This way when the mail comes in it doesn’t end up on a kitchen counter or coffee table. You can deal with the mail when you have time without it cluttering up your home and making it look messy. If you want to get rid of the paper in your home scan all your bills and important paperwork. Save into a file on your computer. I also recommend making a back up on an external hard drive that will go into your fire proof box or safe. Shred the actual copies. Congratulations! You’ve made it through the difficult task of getting rid of paperwork now let’s declutter some more by getting rid of things you no longer use. Check out my post on How To Organize Your Paperwork. Take your donate box and garbage box to your closet. Go through every item of clothing and decide what you want to keep. My own personal rule is, if I haven’t worn it in a year, I’m donating it. Next start going through your kids clothes. You may have a lot of keep stuff in this section depending on the age of your child and the condition of their clothing. Do not keep everything. Keep unique stuff only. Here’s what you have to keep in mind when going through your kids clothing and deciding what to keep, what to donate, and what to pitch. One day this child will be an adult and will have absolutely no interest in the clothing he or she wore as a baby. They may contemplate the possibility of you having some sort of hoarding disease. Do you want your child to think you are a closet hoarder? No? Then get rid of it. Now that you have gone through all the clothing, close up the box for donations and pack it into your vehicle to drop off during your next errand run. I used to be a beauty product hoarder. A couple years ago when I had an eye infection I threw out all my makeup, brushes, and sponges and bought all new. I stopped being a beauty product hoarder after that and learned to throw away things. Even though I love my different smelling lotions I only buy what I will use now so that I don’t waste money. Take your garbage box and head to your bathroom or linen closet. Go through all your products and remove any and all products you don’t use or may have gone bad. Yes beauty products go bad. Use this guide as a reference. Fragrances – Several Years or until the scent changes. The majority of cleaning products are only good for up to 2 years. After that the product may not work as well. Especially if it has some sort of disinfectant in it. So toss all your bad cleaning products. Check out my post How to Organize Pots and Pans to get your cabinet organization under control. Now we can start the final phase of our decluttering process. Going through all the knick knacks, misc items, wall art, kitchen gadgets and everything else that might be causing your clutter anxiety. My general rule is this; if it doesn’t serve a purpose, isn’t a photo, isn’t an important memory, or isn’t worth anything, it’s not worth keeping. You can decide what your own guidelines for keeping these types of items are. When it’s over you should feel good about what you’re giving away and how clutter free your house looks. If you made quick decisions on things your home should be clutter free in less than a weekend. Now all that’s left to do is to take your donate boxes to the donation center of your choice. Sit down with a glass of wine, pat yourself on the back and enjoy your clutter free home. 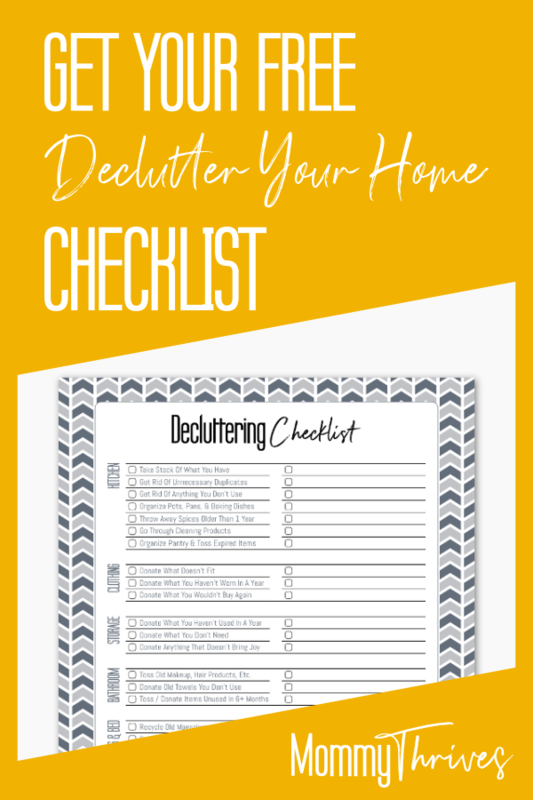 Now that you know how to declutter your home fast let me know in the comments what your hot spots are and how you plan on tackling them. Follow me on Pinterest and pin this to your organization and cleaning boards.